Body: Two-plus-two coupé; monocoque, fully hot-galvanised lightweight steel body with aluminium doors; driver and front passenger airbags operating in two stages; side and head airbags for driver and front passenger. Power Unit: Water-cooled horizontally-opposed six-cylinder; engine block and cylinder heads made of aluminium; four overhead camshafts, four valves per cylinder, variable valve timing on intake side and valve lift switchover (VarioCam Plus); hydraulic valve play com - pensation; bi-turbocharging, turbocharger with variable turbine geometry (VTG); Direct Fuel Injection; two three-way catalytic converters on each row of cylinders, each with two oxygen sen - sors; 10.4 ltr (2.3 imp gals) engine oil; electronic ignition with solid-state distributor (six ignition coils). Power Transmission: Engine and gearbox bolted to form one drive unit; active allwheel drive with electronically controlled power distribution (PTM); six-speed manual gearbox; seven-speed PDK Porsche- Doppelkupplungsgetriebe as an option. Chassis and Suspension: Front: Spring strut axle in McPherson design optimised by Porsche with independent wheel suspension on track control arms, longitudinal arms and spring struts; conical stump springs with inner-mounted vibration dampers. Rear: Multi-arm axle with independent suspension on five arms; cylindrical coil springs with co-axial inner-mounted vibration dampers. PASM Porsche Active Suspension Management with electronically controlled vibration dampers; two control maps for manual selection. Brakes: Twin-circuit brake system split front-to-rear. Front: Six-piston aluminium monobloc brake callipers; cross-drilled and innervented brake discs measuring 350 mm/13.78"" in diameter and 34 mm/1.34"" across. Rear: Four-piston aluminium monobloc brake callipers; crossdrilled and inner-vented brake discs measuring 350 mm/13.78"" in diameter and 28 mm/1.10"" across. PSM Porsche Stability Management; vacuum brake servo; Brake Assistant. * In conjunction with the optional Sport Chrono Package Turbo and six-speed manual gearbox acceleration from 0 - 100 km/h is 0.1 seconds faster. 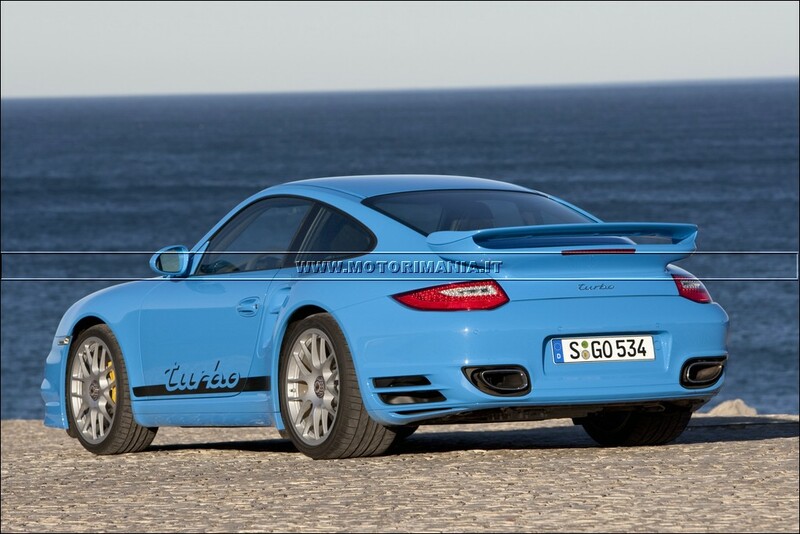 ** In conjunction with the optional Sport Chrono Package Turbo and PDK acceleration from 0 - 100 km/h is 0.2 seconds faster. The Most Fuel-Efficient and Powerful Top-of-the-Range 911 of All Time Introducing the new 911 Turbo making its debut at the 2009 Frankfurt Motor Show, Porsche is once again setting the highest standard in the high-performance sports car segment. Indeed, the development borne out by the Turbo for greater efficiency on lower emissions as well as extra driving dynamics on less weight points convincingly into the future. The heart and highlight of the new Porsche Turbo at the dealership in Germany as of 21 November is of course the new power unit now displacing 3.8 instead of 3.6 litres. This engine for the first time developed brand-new from the ground up in the 35-year history of the 911 Turbo comes with Direct Fuel Injection, an efficiency-enhancing expansion-type intake manifold, and a turbocharger exclusive to Porsche with variable turbine geometry (VTG) on a gasoline power unit. The result is not only an increase in output over the former model by 20 bhp to 500 bhp (368 kW), but also an increase in peak torque up by 30 Nm/22 lb-ft to 650 Nm/479 lb-ft. The PDK double-clutch gearbox is a further development of the transmission already featu - red in the 911 Carrera with reinforced components. The combination of PDK, Direct Fuel Injection and turbocharging provides a new level of efficiency, agility, response and performance, the 911 Turbo with PDK and the Sport Chrono Package Turbo accelerating from a standstill to 100 km/h in just 3.4 seconds (Cabriolet 3.5 seconds) with the help of Launch Control. Supreme fuel efficiency: by far the most efficient high-performance sports car Fuel economy up to 16 per cent better than the competition even under the stricter EU5 standard gives the new Porsche Turbo a unique position in its market segment. In concrete terms, average fuel consumption of the 911 Turbo with PDK is down versus the former mo - del with Tiptronic S by 2.2 to 11.4 litres/100 kilometres /equal to 24.8 mpg imp). In over - land traffic both the Coupé and the Cabriolet, thanks to PDK with its optimum gearshift and the transmission of power with minimum losses, may easily return fuel consumption of less than 10 litres/100 kilometres (28.2 mpg imp or better) (extra-urban fuel consumption to the EU5 standard: Coupé 8.1 ltr/100 (34.9 mpg imp), Cabriolet 8.2 ltr/100 km (34.4 mpg imp). The overall balance of CO2 emissions has improved by an even greater margin, with CO2 down by almost 18 per cent thanks to the changeover from a converter automatic trans - mission to the Doppelkupplungsgetriebe. Emissions are also down on the manual gearbox model by approximately 11 per cent. With the 911 Turbo already ranking right at the top in terms of efficiency, its lead over the competition is now improving dramatically once again. Indeed, the Porsche 911 Turbo is the only car in its segment to remain below the Gas Guzzler Tax limits in the USA, that is the additional tax imposed on vehicles with heavy fuel consumption. Even with its manual gearbox featured as standard, the new Turbo accelerates from a stand - still to 100 km/h in just 3.7 seconds (Cabriolet 3.8 seconds). With the PDK gearbox the new Turbo completes the same exercise another tenth of a second faster, and with the optional Sport Chrono Package Turbo featuring dynamic engine mounts for the first time, the top-ofthe- range 911 offers an even higher standard of performance still, the integrated Overboost function increasing maximum torque by 50 Nm/37 lb-ft to no less than 700 Nm/516 lb-ft.
To provide yet another improvement of both driving dynamics and motoring/vibration com - fort, the Sport Chrono Package Turbo also comes with dynamic engine mounts changing their stiffness and damping as a function of driving conditions. This special feature signifi - cantly reduces the transmission of vibrations from the entire drivetrain and, in particular, from the engine to the body of the car. New: Porsche Torque Vectoring PTV for even higher speeds in bends The performance of the new 911 Turbo enhanced to an even higher standard goes hand in hand with driving dynamics even more outstanding than ever before. Accordingly, the further development of PTM Porsche Traction Management all-wheel drive and PSM Porsche Stabi - lity Management for even greater driving dynamics is supported by new, optional Porsche Torque Vectoring (PTV). This innovative system comprises a mechanical rear axle differential and, intervening in the brakes on the inner rear wheel in a bend as required, enhances the agility of the car while reducing any tendency to understeer. The result is even greater steering precision and sta - bi lity in bends, together with higher speeds on bends and winding roads. PTM Porsche Traction Management now comes with an even higher standard of driving dyna - mics, the change in power distribution from front to rear taking place even more smoothly. The big advantage for the driver is the very well balanced and forgiving behaviour of the car. 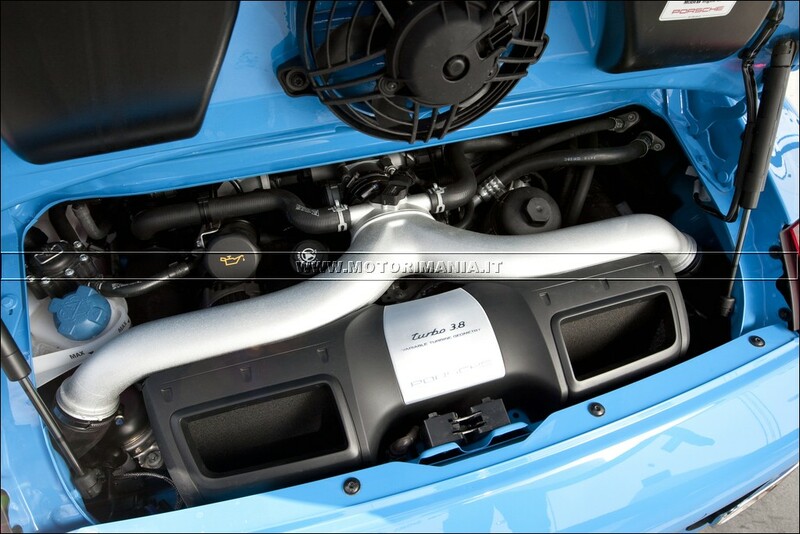 PTM communicates in the new 911 Turbo with Porsche Stability Management likewise fea - tured as standard. PASM Porsche Active Suspension Management, in turn, gives this unique high-performance sports car another active control system for optimum driving dynamics. Masterminded by a computer, this sophisticated damper technology benefits from the inter - action of PTM and PSM by providing even more dynamic control. The driver is able to choose in this process among the Normal and Sport Mode, with the continuous damper adjustment following a more comfort-oriented or sporting and firm control map. 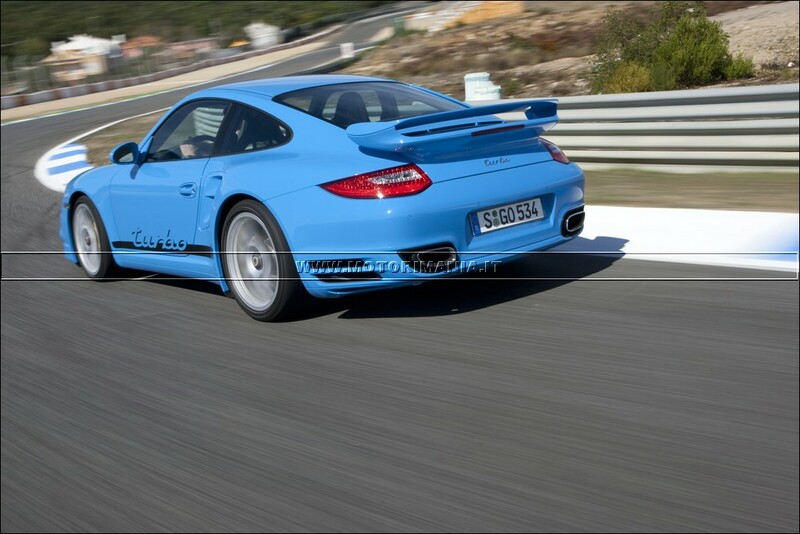 As a result, the driving behaviour of the 911 Turbo adjusts flexibly to the individual wishes of the driver. A fundamental point of Porsche’s safety philosophy is that brake power must always exceed engine power several times over. Precisely this is why the front wheels come with six-piston swing-calliper disc brakes measuring 350 millimetres or 8.9"" in diameter. The four-piston swing-calliper brakes at the rear also come with discs measuring 350 millimetres across. Like all models in the 911 range, the new 911 Turbo is also available with PCCB Porsche Ceramic Composite Brakes with ceramic discs measuring 380 millimetres/9.6"" in diameter at the front for even faster response, very good resistance to fading and absolutely no corrosion. A further advantage of PCCB is the reduction of weight versus the standard brakes with grey-cast iron discs by approximately 18 kg or 40 lb. A characteristic feature of the most powerful production 911 is the front apron with large cooling air intakes and bar-shaped LED direction indicators. New features are the titaniumcoloured louvers in the side air intakes and LED daytime driving lights replacing the conven - tional foglamps. Available for the first time as an option on the new 911 Turbo, dynamic bending lights improve illumination of bends in the road ahead by the headlight module following the course of the road by swivelling in their angle up to 15o. Indeed, the sophisticated design of this doublelens projection system bears out the progressive and striking character of the new 911 Turbo most convincingly. In their new design, the double-arm exterior mirrors offer a better view to the rear and pro - vide optimised aerodynamics with the mirror glass better protected from dirt. Nineteen-inch Turbo II wheels in forged technology and twin-tone looks featured as standard on the new 911 Turbo provide a particularly appealing touch in terms of style and design. The rear view of the new 911 Turbo is even more powerful and muscular, not only on account of the classic split wing, but also and above all due to the newly designed rear lights in LED technology and the much larger tailpipes. The latest generation of the top 911 in the range also comes with a new generation of stee - ring wheels. Models with the manual gearbox feature a new three-spoke sports steering wheel in modified design as standard. 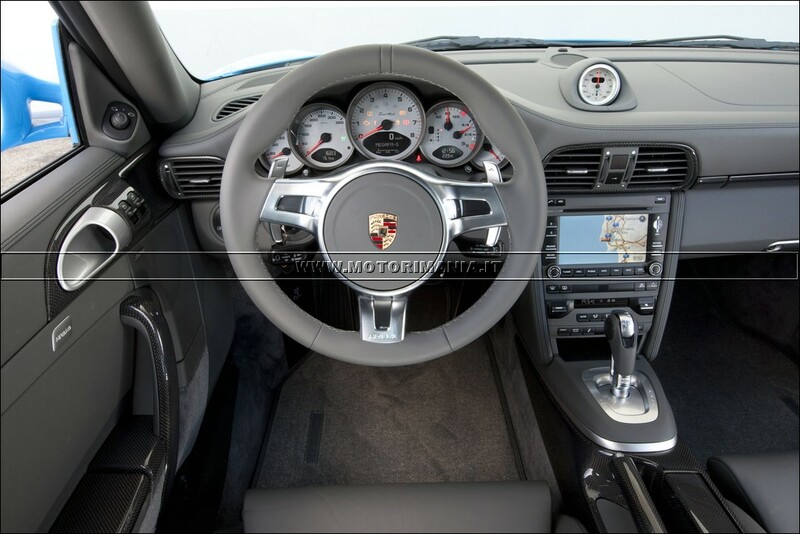 Cars with the Porsche-Doppelkupplungsgetriebe are available for the first time as an alternative to the PDK steering wheel featuring its proven shift buttons with a new, optional three-spoke sports steering wheel complete with gearshift paddles. In conjunction with the optional Sport Chrono Package Turbo both the paddle and the PDK steering wheel come with push buttons and integrated displays. As a function of the button pressed, either the ""Sport"" or the ""Sport Plus"" light will switch on. And if the driver has acti - vated Launch Control, this function is also shown.